Rural Ireland firmly believes the Government has forgotten about it. While just 12 months ago, the Taoiseach said farmers were the heartbeat of rural Ireland and the lifeblood of the recovered economy, he seems to have forgotten a couple of important things, so it is little wonder he is far from popular among farmers at the moment. Two years ago, the Irish Independent’s farming website, FarmIreland, interviewed more than 1,000 farmers at marts around the country on various topics of the day. Just over 30pc of the farmers said if there was a general election in the morning, they would vote for Fine Gael. However, when you strip back the top-line figures, a considerable proportion said at the time “all politicians are the same”, and the candidate was more important than the party. Last week, I went to a farmers’ meeting in Williamstown, Co Galway. One of the 60 or so farmers who turned up, and stayed until well after 11pm, made a very clear point about the short-term memory of politicians. Many farmers interpret the continuous stream of reports on climate change as direct attacks from urbanites, who they feel know very little about farming. Unfortunately for Leo, his comments put him firmly in that category for many farmers with his misguided, to say the least, comments that he would be cutting back on the amount of meat he eats. It is easy to say the Government has farmers’ backs, but actions speak louder than words, and the lack of clarity around what Leo will do to help farmers in the case of a no-deal Brexit is not helping matters. While Brexit might be preoccupying Leo and his Government now, he should not forget it is also front and centre of farmers’ minds. Brexit has the potential to affect the agri-food sector more than any other, and farmers have been given zero guarantees or clarity on what exactly will happen in the event of a no-deal Brexit. Just a few months back, he said the Irish economy was so strong it would grow, even if there was a hard Brexit. Leo obviously hadn’t got the memo on agri-food, the country’s largest indigenous sector. The beef sector alone is facing a negative impact to the tune of €700m-800m. Nor should he forget that farmers are still the lifeblood of rural Ireland, and regardless of where their income comes from, they spend the majority of it in their local community, helping keep other rural businesses alive. 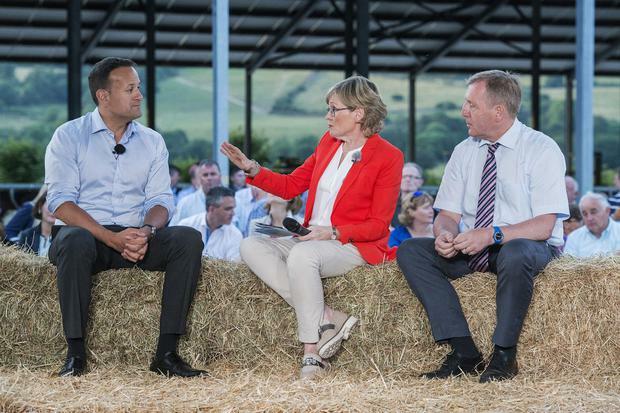 Last year, one of Leo’s major “farming” events was a Fine Gael-managed exercise in PR, which was live-streamed on Facebook. Maybe if rural Ireland had better broadband, more people would have seen it. If the Taoiseach wants to hear a non-filtered view from rural Ireland and enjoy an approval rating higher than the 25pc of farmers who are “happy” with his performance on agriculture, as a ‘Sunday Times’ poll has suggested, he would be well advised to take the time to visit a mart or two, and really get an idea of how farmers are feeling. After all, his first visit to the Ploughing Championships was in advance of his announcement to run for party leader. Mr Varadkar would also do well not to forget that farmers are some of the most active voters on election day – probably because they get up even earlier than the Taoiseach. And while they may not have the option to put a number in a box with Leo’s name beside it, his rural representatives may well feel the impact when it comes to the farmers’ election choices.